(From Sony lens literature) Get superb value from the Sony SAL-28F28 wide-angle lens for interiors, group photos and landscapes. Enjoy high-contrast, panoramic or inclusive urban shots with great detail. Superb value in a wide-angle lens for interiors, group photos and landscapes. With its precision optics, compact size and wide 75 degree angle of view, this lens is an excellent choice for sharp, high-contrast shots when you're working indoors, with people in groups, or in landscapes and urban scenes when you want a panoramic or inclusive shot with lots of detail. Mounted on the Sony a (alpha) DSLR-A100 camera, this lightweight wide-angle lens provides a near-standard 42mm focal length (35mm equivalent). 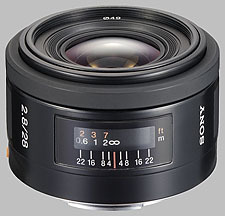 The Sony 28mm f/2.8 SAL-28F28 doesn't have any user reviews yet!